There is another Kings coupon this week so check the circular that came in your mail. These can be used at your Pathmark but please check with customer service before shopping because some Pathmarks have different acceptance policies. 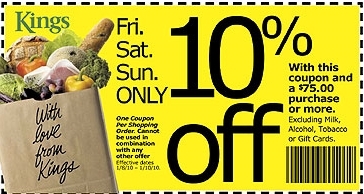 The coupon is for today & tomorrow (Sat & Sun) and it’s 10% off when you spend $75. Make sure to hand this coupon as well as any of their store coupons before the manufacturer coupons.